My grandfather's house, built in 1917 in the Northern California foothills. My mother was born here. Arts & Crafts style simplicity: lath & plaster walls, wood floors, wood baseboards, trim and picture rails. The most flattering paint style is to extend the ceiling off-white down to the picture molding. That way the contrast shows. It's not period to have landlord-white walls. There were many layers of color on them. There are many built-ins: china cupboard in the breakfast room, buffet in the dining room, large linen cupboard upstairs, small one down. Built-in bookcases besides the fireplaces. Porches: screened dining/living room porch, sleeping porches, entry porches, a balcony upstairs. Many "places", individually planned & built spots with character: the top floor window seat, the schoolroom toybox/window seat and flanking bookcases. This room has a toybox/seat, and in the closet, a small door that goes back in under the eaves to a private playroom. (well, extra storage, if you're a grown-up) Under the stairs, which was the telephone closet originally, are two small doors, going back further in. It feels friendly when you walk in the door, although everybody turns the wrong way trying to go somewhere, for the first 6 months. There's a basement apartment my grandfather made when he was 80. Shored up the foundations and poured new concrete floors. Well, he had been a mining engineer. I've lived here for 25 years, this Constitution Day. 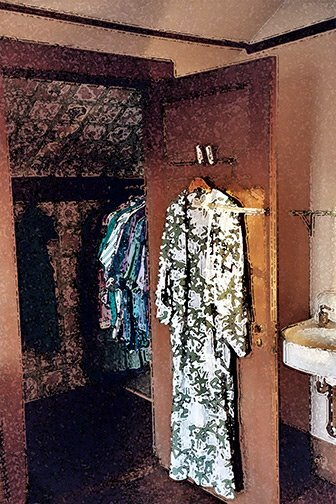 The yukata hanging on the closet door was my sister's. We bought them during a year in Japan, my senior and her freshman year in high school. She's gone now. The house is about to go up for sale. Do you define yourself by what you wear?